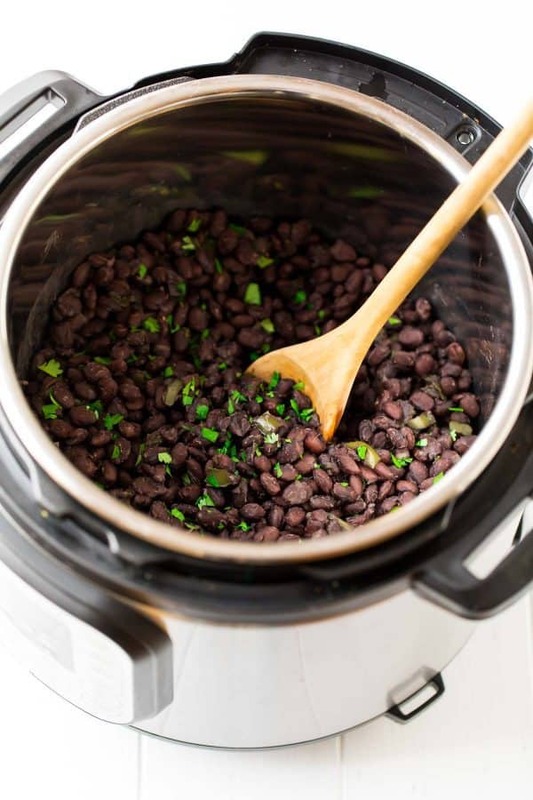 Instant Pot Black Beans | No Draining or Soaking Required! It’s a “how to” day! 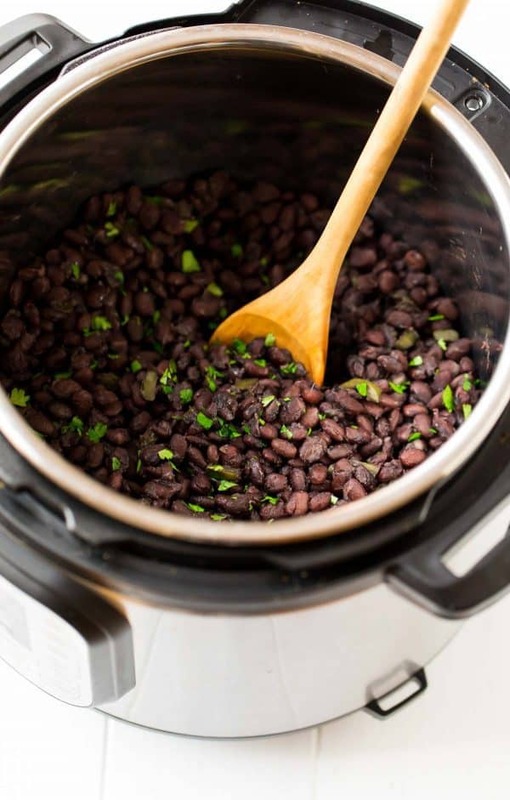 I’m sharing the deets on how to make the best ever Instant Pot Black Beans. This easy method for making black beans in the pressure cooker requires no soaking in advance and no draining of the pot after they’re finished. I’ve included tasty ideas for ways to use your big, beautiful pot of black beans once you are finished too. I’m quite unabashed in my love of beans, especially black beans. They’re ultra affordable, high in protein and fiber, and work well in recipes that range from Crock Pot Mexican Casserole to my favorite Instant Pot Chili to even brownies (I haven’t tried my own recipe yet—anyone interested?—but this Black Bean Brownies recipe has my eye). For maximum weeknight ease, I usually reach for canned black beans, but I know from personal experience that when you cook the beans yourself from dried instead of using canned beans, their texture is far superior. If you are really watching your budget, dried beans are less expensive than canned beans too. The issue with cooking black beans? TIME. Dried beans need to be soaked overnight before cooking, a small detail I have an impressive track record of forgetting to complete before I head to bed. Even if you use the quick-soak bean cooking method (soaking the beans in boiling water for about an hour), it still takes an additional hour to cook them from there. How Long Does It Take to Cook Black Beans in the Pressure Cooker? My recipe testing found that, for the water-to-black-bean ratio used, 35 minutes of high pressure followed by 20 minutes of natural release yielded beans that had the perfect amount of chew. They retained their shape on the outside and were tender and creamy on the inside. If you add the cooking time up (55 minutes of pressure + release, plus the 10 or so minutes it takes the Instant Pot to come to pressure), it’s still more than an hour, but the beauty of the method is that it’s completely hands off. It’s also about an hour faster than cooking the dried beans on the stove with the quick-soak method. How Long Does It Take to Cook Dried Beans in the Pressure Cooker? If you are thinking “hiiiiii, you just answered that,” I’m adding this FAQ as a word of caution: this method is intended for Instant Pot Black Beans. Larger or harder beans (such as cannellini, navy, or pinto beans) will need longer, so if you are using the method below, I’d suggest adding several minutes to the pressure cook time. 1 pound dried beans + 8 cups water: After 30 minutes of pressure and 20 minutes of natural release, my beans were perfectly cooked, BUT there was an excess of water in the Instant Pot that needed to be drained. I wouldn’t have minded for just plain old black beans, but the excess water diluted the wonderful bonus Cuban flavors I’d added. Plus, draining the beans was an extra step that I wanted to see if I could eliminate. 1 pound dried beans + 3 cups water: The winner! This ratio took 35 minutes of pressure cooking + 20 minutes of natural release, but no draining was required, as the beans absorbed nearly all the liquid. There was a bit of extra liquid in the Instant Pot, but I found that once I stirred the beans, I like having it there for serving, as it ensured the beans were not at all dry. While you can use this method to make regular ol’ Instant Pot Black Beans (which you can then use in any recipe that calls for canned black beans or cooked black beans), I wanted to make them extra special and flavorful. I took inspiration from the islands and made these Instant Pot Black Beans Cuban (or Cuban-ish) by incorporating a few star ingredients in Cuban cuisine: bell pepper, onion, cumin, bay leaves, and oregano. I loved the extra depth of flavor and caught myself eating these right out of the pot. While these black beans are Cuban inspired, you certainly don’t need a Cuban recipe to use them. The flavors and ingredients are fairly ubiquitous in Mexican cuisine too, so any Southwest style of recipe would be excellent with these seasoned black beans swapped in place of plain. Want to make Instant Pot Black Beans Mexican? Try adding chili powder and, if you are feeling dangerous, a pinch of cayenne. Instant Pot Black Beans: Why Should I Bother? Where canned beans can be a little mushy, the Instant Pot Black Beans were pleasantly firm without being chewy, and the insides were tender and creamy. As odd as it sounds, I also felt that the Instant Pot Black Beans tasted more “pure” than ones I’ve had from a can. 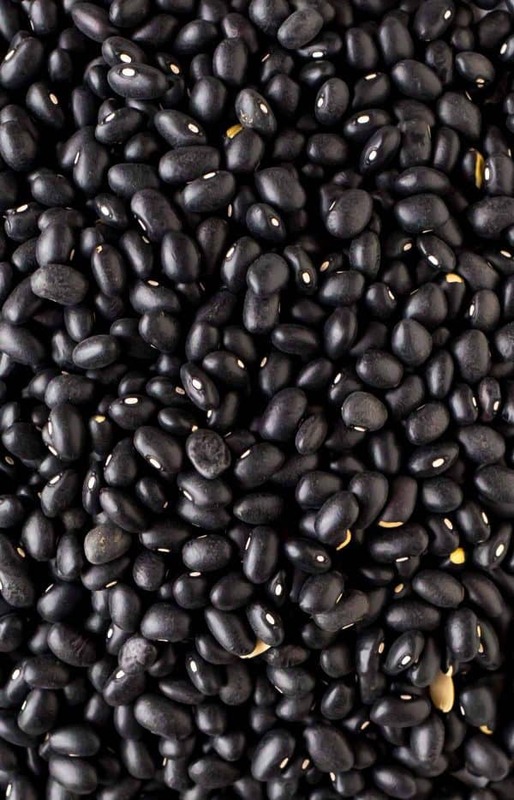 Cooking your own black beans also means you can customize them by adding booster ingredients and spices. I opted to keep the Instant Pot Black Beans vegan, but for a special occasion, I can see incorporating black beans with bacon being a tasty adaptation. The spices are simple to edit (see “Turning Up the Flavor” above as well as the recipe notes), and at $1 to $2 per pound, black beans are a bargain. These black beans are very freezer friendly, so you can cook a batch and portion them into 1 1/2 cupfuls that you can reach for any time a recipe calls for a 15-ounce can of black beans. A few to recipes get you started: Mexican Chicken Casserole, Slow Cooker Taco Casserole, and Mexican Chicken and Rice. Instant Pot Black Beans and Rice: CLASSIC! Mix with brown rice for a simple meal. You can also top with chicken, a fried or poached egg, and avocado or salsa. Add to a tofu or egg scramble. Mash with avocado and spread on toasted bread for next-level avocado toast (I wouldn’t be able to stop myself from adding an egg to this too). Fill burritos, quesadillas, enchiladas, tacos…and all other good things involving tortillas and cheese. Make the Cuban Beans and Rice that I’m sharing later this week! The best way to make black beans in the Instant Pot. Easy method that requires no soaking and no draining of the beans. Recipe includes options to make the black beans Cuban, or keep them plain and use for any recipe that calls for canned black beans. Rinse and drain the beans and pick out any stones or bad, cracked-looking beans. Set aside. Set the Instant Pot to SAUTE and add the olive oil. Once the oil is hot and shimmering, add the onion, bell pepper, and salt. Cook until the vegetables soften, about 4 to 6 minutes. Stir in the cumin, oregano, bay leaves, and garlic and cook until the spices are very fragrant, about 30 seconds. Add the water and beans and stir. Cover and seal the Instant Pot. Cook on HIGH pressure for 35 minutes. When the timer goes off, allow the steam to release naturally for 20 additional minutes. Remove the lid. Remove the bay leaves and discard them. Enjoy warm or let cool completely and store in individual containers. Thanks for this recipe! I’ve been using a pressure cooker for years now instead of buying canned beans. It’s really the reason I bought my first one, and I’ve started making full meals in the Instant Pot as of late (including your lentil curry! Delicious!) I use a heaping 1/2 cup of dried beans in recipes that call for 1 can. I find that they’re usually finished cooking by the time I finish my mise en place. I use canned beans in a pinch, but prefer to make them from dried beans if possible. I can’t believe I never though to make them in the instant pot. Awesome idea! I hope you love it if you give it a try, Danielle! These definitely would be amazing in tacos, Gaby! Easy and delicious. I’m freezing them in 1 Cup portions to use in your black beans and rice with plantains and roasted peppers. Thank you! The beans have lots of flavor and making them in the Instant Pot is quick. Elaine, I am so happy that this method worked out so well for you! Thanks for letting me know, and I hope you enjoy the plantain and pepper dish too! I just love black beans. And what an easy alternative to the canned version. I am going to try this for sure! Question: in the blog above you said 4 cups of water to a pound of beans was the perfect ratio. The recipe calls for 3 cups of water to a pound of beans. Just trying to determine why there is a difference! Making this tomorrow, so I hope you see my question. The recipe sounds great. Thanks! Hi Courtney, I’m so sorry for the discrepancy! The recipe is correct at 3 cups of water. Thank you so much for pointing that out—I’ve got it fixed now. Thank you for the quick response. 3c was perfect. We liked the way this came out, but not quite flavorful enough for us. I think I’d double the cumin and oregano, maybe triple. I also wonder if I skipped pre-cooking the pepper and onion I forgot there would be a bit more of that flavor? Precooking it smelled delicious but it turned to mush cooked with the beans. I also wonder if I skipped pre-cooking the peppers and onions if there would be a bit more of that flavor. Don’t want anyone to think I forgot the pepper and onion! Hi Courtney, I do think you can definitely adapt the spice levels to your taste! As far as sautéing the pepper and onion, that is kind of a matter of personal taste. Personally, I don’t care for the taste of raw onion, and I enjoy the greater depth of flavor that sautéing vegetables adds to my dishes. Texture-wise, unless you left the vegetables pieces quite large, pressure cooking does make vegetables very soft—it comes along with the pressure cooking territory. You could sauté the veggies separately on the stove to your desired texture, then stir them in at the end if you want the veggies to be more distinct! I’m thinking my beans were too old ’cause it took two 35 minute sessions to cook them! Tasted great though when they were finally done. Hi Marsha, older beans would definitely affect the cooking time. I’m glad you enjoyed the recipe! These are OUTSTANDING. The only thing I didn’t like is that now I can never use canned beans again. You’ve ruined me but in a good way. Thanks for a perfect and easy recipe! SOOOO happy you loved these Steph. Thanks for the great review too! I’d like to do some batch cooking to simplify things during the week. How would doubling the recipe affect the cooking time? Would you advise doubling both the water and the beans? or should I reduce the water to 5 1/2 cups when doubling? Hi Allison! Honestly, I think that would be really tricky because the Instant Pot is already pretty full. The most I’d try to start is 1.5 times the recipe, but it would be an experiment. I’m sorry I can’t advise on specific cooktimes, as I’ve never done it myself. If you do try increasing the amount, I’d love to hear how it goes! Did you try this? I don’t have an “InstantPot” but my pressure cooker is huge. I double this recipe every time I make it so I can freeze beans for future burrito nights. I have the mid-sized pot and it seems to work just fine. The last time I made them they were slightly liquid-y. Perhaps you’re on to something with the 5.5 cups. Thanks for chiming in, Gordo! How does cooking beans in a pressure cooker (and skipping soaking) affect the digestibility? I know that soaking is supposed to help with digestibility so I’m wondering if this negates the need for that as well? Brittany, I haven’t investigated that, so I’m afraid I’m not sure! So I was REALLY hesitant that this would work. I mean really. I’ve eaten a lot of canned black beans, and some that I’ve cooked myself, but nothing compares to the perfect texture and flavor that comes from cooking black beans this way. I was really amazed at not only the ease of this and the flavor, but the texture was better than any black beans I’ve ever had. I will never buy another can of black beans again! Side note: I don’t have an “Instant Pot” but I do have a modern pressure cooker. Brittany, I am so glad this exceeded expectations and that you loved how the beans came out. Thank you for letting me know! Absolutely! After these came out so well I wanted to try chickpeas. Chickpeas weren’t really my favorite beans unless they were in hummus, but cooking them in the pressure cooker was a game changer! Slowing getting to where I won’t buy anything canned! Next: tomatoes? Would Chicken or Vegetable broth instead of water add more flavor or is it not necessary? Beth, I think it has plenty of flavor without, but you can feel free to use broth if you prefer! I’d cut down on the salt a bit in case your broth is salty. You can always add more salt at the end to taste. I hope you love the recipe! Came across your blog today; found this recipe and decided to make it to serve with chicken tacos tonight – so I used chili powder in them too. (My very first recipe in my new Instant Pot.) These are FANTASTIC – like other commenters, I’m not sure I ever want to use canned black beans again! Thank You for your generosity in sharing so many great-sounding recipes – your 100 Calorie Strawberry Bars are next on my list! Emmy, I am so happy this hit the spot for you both and will be a go-to! Thank you for letting me know and I hope you love the bars too! I have to say I’m a little underwhelmed. Maybe my expectations were too high after reading the reviews, but I followed the recipe exactly and the beans didn’t seem fully cooked. Maybe 5-10 more minutes? I’m brand new to the instant pot, though, so that could be it too. So far, I’ve made rice twice and lemon chicken once. The chicken was amazing, but the rice seemed a bit undercooked too, even after extending the time. I live in Denver – could high altitude affect cooking time in the pressure cooker like it affects the amount of leavening agents in baking? Alissa, I haven’t experienced high altitude cooking, but after doing some reading online, it seems like that definitely could have affected things depending upon your elevation. I’d suggest looking for some conversion charts online, then finding one that matches your elevation. I hope it goes better next time!! I did some research too after writing the review and it seems that based on my elevation, I should be adding about 17% more cooking time to all my recipes. So for the beans, I should have cooked them for 41 minutes instead of 35. Glad I found out early in my instant pot experimenting. I’ll try the beans again soon and let you know. Thanks! Alissa, thanks for reporting back! That’s great to know. I am excited to try this (especially because I want to try them with your Instant Pot chili recipe)! Any thoughts on the cooking times for other types of dried beans? Lisa, I’d actually suggest looking online for the cook times and liquid ratios for whichever type of beans you choose. I don’t have a set chart, but I think you’ll be able to find what you are looking for. You can always start with this blend of spices/ingredients, then swap the beans out for other types. Thank you for the recipe. With freshly procured dry beans and a prep at sea level, 3 cups of water was not enough. I know this is subjective, but for me it was too dry. I’ll try 4 cups next time. Thanks again. Steve, thanks for reporting back and I hope you love it with the 4 cups next time! You have inspired me to purchase my first pressure cooker! I have never been a cook, and don’t have much space, but I am ready to start! YAY, congrats David! It takes a bit to get the hang of it, then it’s amazing! This is the first time cooking dry beans instead of buying a can. They came out perfectly. YAY! I’m so glad they were successful, Penny! Thanks so much for reporting back. Thank you so much for stating in print that 8 cups water to 2 cups dry beans is way way way Too much water. I’m awake 2 hours later than I wanted because I followed another bloggers “no fail” bean ratio. I even reduced it to 6 cups because I counted the can of diced tomatoes as part of the cup. If I just wanted to cook black beans (or in my case black eyed peas) sans any tomatoes, onion, garlic or curry, I could’ve just drained off the FOUR EXTRA CUPS of water I had leftover. But I seasoned these beans lovingly and they smell delightful. So I dumped in about a cup of white quinoa to soak up the water & hopefully retain some of the flavor. I should learn my lesson because this happens all the time. Slow release, quick release, no matter what I do I have excessive liquid. For meats I do take out the meat & hit sauté to thicken the sauce. Do you have any suggestion? I made 1 minute pasta (well, come to pressure, then 1 minute cook, then 5 min natural release). The author insisted on 4C water, 1 cup pasta, plus salt/oil. Nope. I had 1 FULL cup of water leftover. With unseasoned pasta that’s fine I guess except the whole point was to not have to drain it. Plus I use filtered water for cooking and I consistently waste a about 2 cups/day or every other day following recipes that call for too much liquid. Hi Kathryn, learning proper liquid ratios in the Instant Pot can definitely be an experiment! It sounds like you’re getting a good instinct for what sounds like too much liquid, and using the saute function when you do have a little extra is a great tip too. Half of my beans turned to mush and half (towards the top) weren’t yet tender. I’m new to pressure cooking and I have the CrockPot brand of cooker, so I’m sure it was just my own error. I will probably use more liquid next time, just to be safe. Thanks for this recipe. I’m glad I tried it, despite the confusing result. I’m just greatful to find simple, basic recipes for this machine. Elle, that IS odd, and I wouldn’t be surprised if the difference in pressure cookers affected the recipe, as I tested this in the Instant Pot. Yes, definitely add more water next time. If you have extra water on top of the beans in the ed, you can always drain it off. I hope it goes better next time! I too experienced a range in texture within the population. I did double the recipe in the 8 qt. pot and that may have contributed, just not sure. This is the first time I’ve not pre-soaked beans and I suspect pre-soaking minimizes the texture variability. On another note, I typically throw in a chunk of kombu (seaweed) to minimize gaseous by-products. It also adds a bit of umami to the flavor profile. Hi John, thanks for reporting back! Doubling could definitely affect it. I hope you still are able to enjoy the beans! Made this on Sunday in my 3 qt Instant Pot. Discovered that I could have left the timing the same. Cut it a tad short, so the beans are still a bit chewy, but learned from that. I just cut the recipe in half. Worked! Not sure if I could have made a full 2 cup recipe in the 3 qt unit. If anyone has, let me know. I wasn’t sure though, if not soaking the beans increased the gas output? I thought that the purpose of soaking beans first was to lessen the gas? Is the pressure cooking supposed to somehow supplant that step? Please explain. Thanks. I added rice to the dish one night, with lettuce and avocado, and the second night I added some stir fried bok choy. Yummy both times! Hi Sondra! Thanks for reporting back! I don’t have any scientific information to give on soaking vs not soaking the beans—I’d suggest you do a google search to learn more. Perfect black beans and water ratio! Beans were delicious at 35 minutes. Thank you. I’m glad it turned out perfectly, Sheri! Thanks for taking the time to leave this review! You said “When the timer goes off, allow the steam to release naturally for 20 additional minutes.” So at the end of the cooking time, do you flip the release lever and wait 20 minutes to open, or do you wait 20 minutes before flipping the release lever? Hi John! You wait 20 minutes before flipping the lever. I hope you enjoy the beans! I love how my black beans turn out. Just wondering if the 3-cups of water will work for other varieties of dried beans? Hi Michael, I haven’t experimented myself, but it should be pretty close for beans of similar size with a similar cook time. I hope that helps! 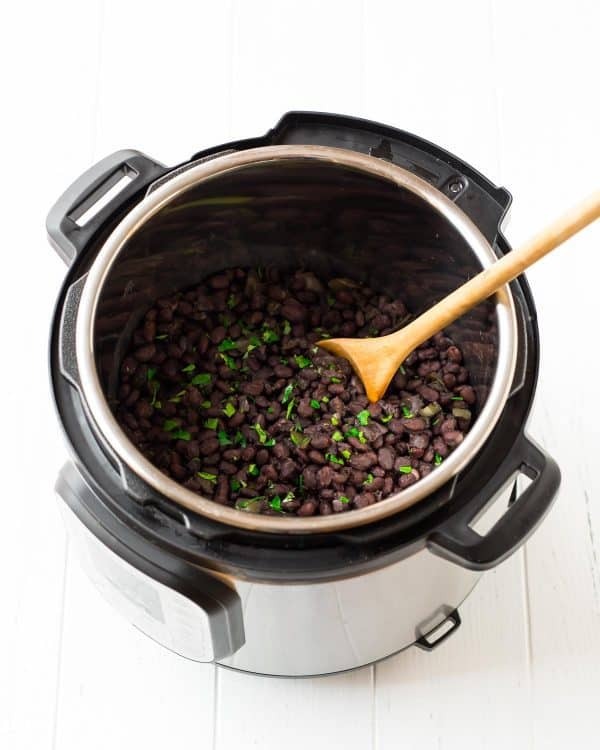 I have tried many online Instant Pot black bean recipes, and this one really NAILS IT. The bean-to-water ratio achieves a perfect texture. My variations: I used garlic, onions, and celery (instead of green peppers, ’cause I didn’t have one) all sauteed in olive oil ; for spice I used cumin, S&P, dash of cayenne and a packet of Sazón Goya. Delicious! Thank you for sharing your tweaks, Christopher! I’m glad the recipe is a winner for you! HOORAY! I’m so glad this was a success for you, Sandra. Thanks for taking the time to leave this awesome review!